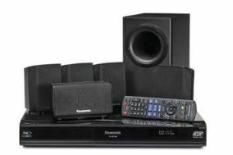 Panasonic SC-BTT350 review | What Hi-Fi? It's taken a while, but now we're seeing all the big AV players producing home cinema in a box systems with Blu-ray players as the source. (In case you've been under a rock, these will of course play your DVDs and CDs, too). And what's more, they're on sale at prices that will surely make DVD-only systems either a thing of the past or simply ultra-affordable. The icing on the cake here is that Panasonic's SC-BTT350 is also 3D-capable. Yes, this is an all-singing, all-dancing 3D Blu-ray home cinema system for something in the region of £400 (hunt around and you'll find it cheaper). With our performance-per-pound review criteria in mind, this Panasonic has got off to a flyer. You'll find four identical satellite speakers in the box, standing just over 10cm tall, and a dedicated centre channel that's not much bigger. In an ideal world you would have these speakers on stands, but some sort of solid surface and with a bit of room to breathe is the next best thing. The subwoofer is slim and around 30cms tall and similarly deep, making it fairly easy to hide in the corner. The unit itself looks like a slightly bloated BD/DVD player and comes with an array of the latest connections and functions. 3D Blu-ray playback performs admirably, delivering a sharp picture that's full of apparent depth, while you'll also find an ethernet connection for Panasonic's Viera Cast streaming service (though content is limited), and DLNA connectivity. Two USB inputs allow for a wi-fi dongle, there's an iPod/iPhone dock and audio return over HDMI to hear sound from your TV through the system via one cable. Watching Ninja Assassin, the picture is certainly vivid and punchy, insight is excellent and more natural colours are rendered faithfully. Motion isn't perfect, but we're happy enough with the Blu-ray performance – especially for the price. Sonically, you get a fast, cohesive, balanced and detailed performance. The subwoofer integrates well, dialogue is clear, and there's surprising punch and power to the sound. With little to quibble about in terms of performance, this ultra-specified all-in-one system is a winner.